COMES FULLY ASSEMBLED for your convenience. No need to waste time putting your aerator shoes together. Simply wear these spiked sandals when walking your lawn for instant aeration. PROMOTES GREENER, HEALTHIER LAWNS - Lawn aerator shoes let water, fertilizer and air get down to grass roots, improving the health of your lawn. 3 DURABLE STRAPS W/ METAL BUCKLES - Our shoes feature strong metal buckles that won't break, unlike other lawn aerator sandals which have flimsy plastic buckles. 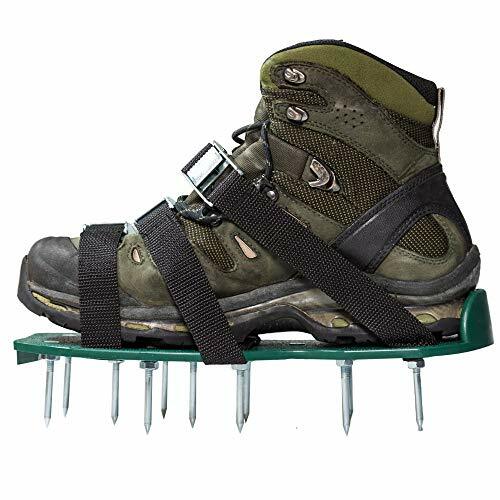 ONE SIZE FITS ALL - Our lawn aerating shoes have a sturdy base and thirteen 2" spikes. CHEAPEST, EASIEST SOLUTION - Lawn aeration shoes are cheaper than an aerator machine rental, and easier than using a hand lawn aerator! If you have any questions about this product by Punchau, contact us by completing and submitting the form below. If you are looking for a specif part number, please include it with your message.